The new major version of Hidden Start was released this week. The most noticeable update is Hstart GUI Tool – HstartUI.exe which is a part of the distribution package now. 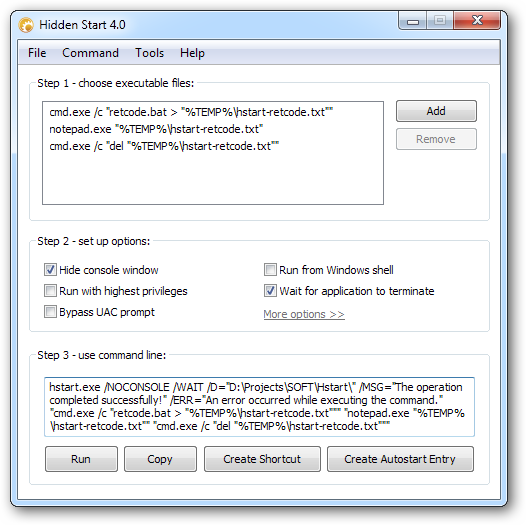 Hstart GUI Tool would help you to build complex command lines and test them immediately. It can quickly create a shortcut on the desktop or an autostart entry in the Windows registry. The new Hstart uses a more efficient parsing algorithm to process complex command lines. The entire program code has been rewritten to make Hstart faster and bug free.